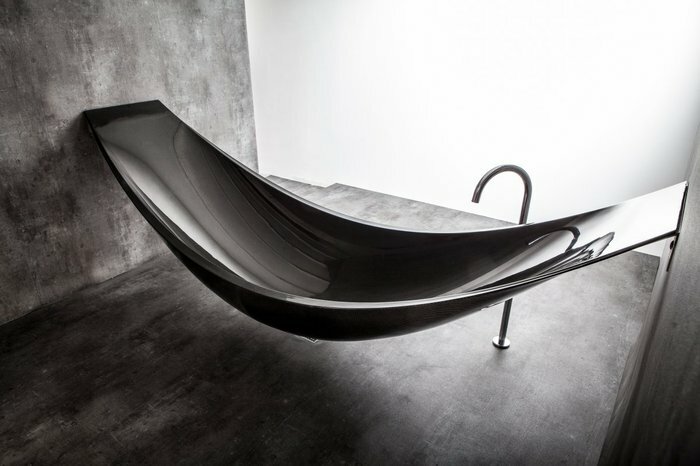 Splinter Works, a UK-based design studio, has created what I think is safe to call the first hammock-inspired bathtub. 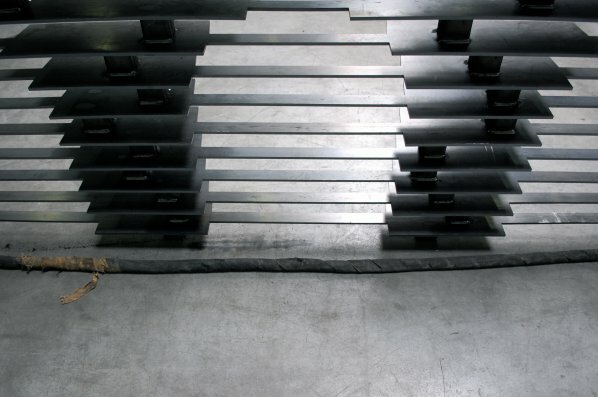 They've basically taken the ability of carbon fibre sheeting to form almost any shape and remain infinitely-strong and built the tub out of it. 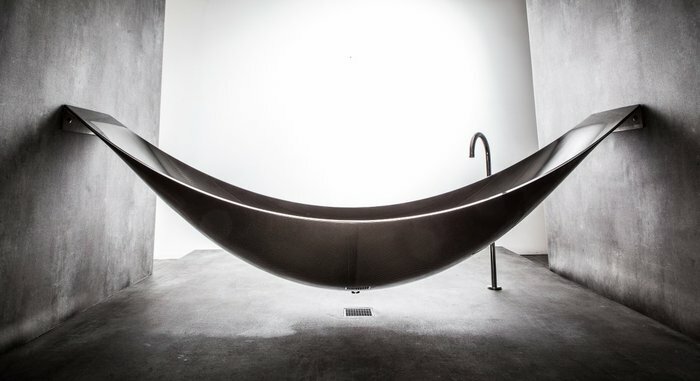 2.7 meters long and mounted on 2 stainless-steel brackets, which can be hidden if desired it's not entirely functionless form, the thick foam center insulates the tub, keeping the hot water hot longer. The optimal setting would be in a wet-room with the center-mounted drain of the tub just suspended over a drain in the floor, but they'll deign to provide a drain-pipe if needed. ps. 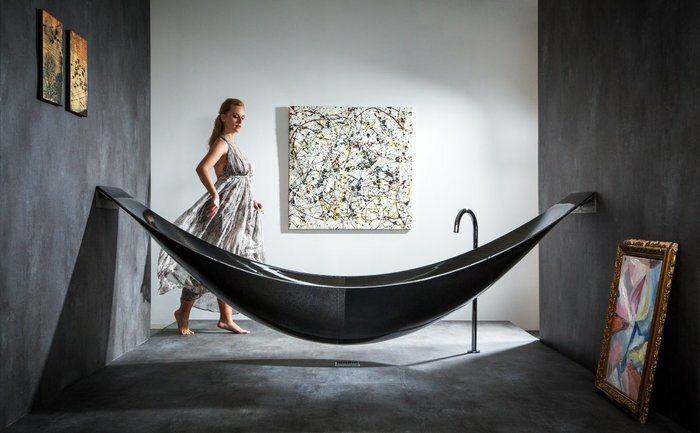 neither the diaphanously-robed model nor the faux-Pollock come with. 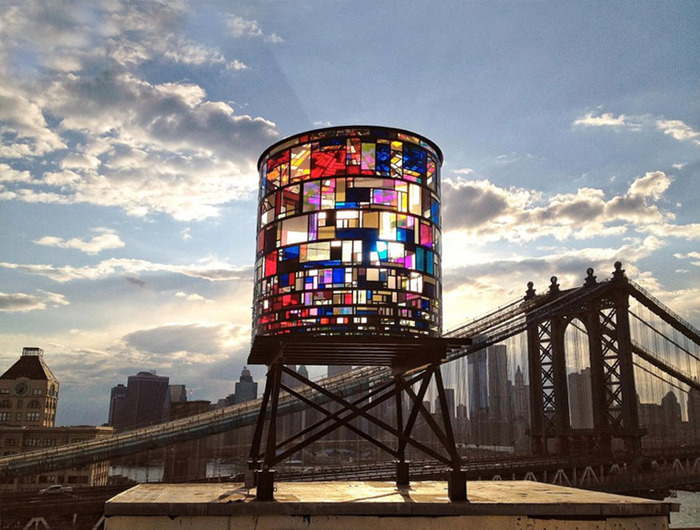 Tom Fruin is a Brooklyn-based artist who tends to work in large, kaleidoscopically-colored plexiglass. 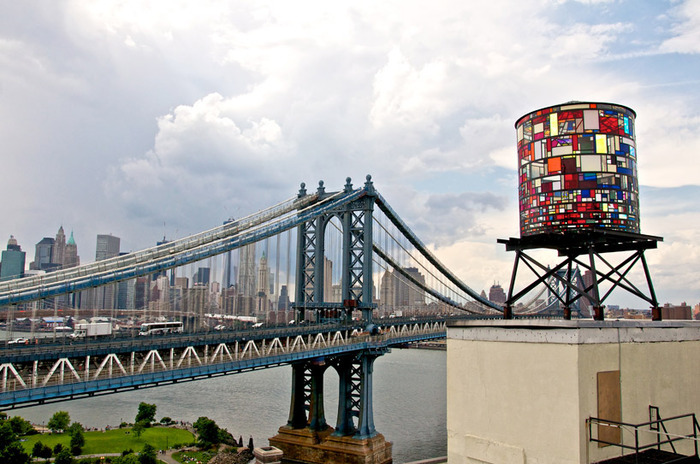 His latest work is at the western edge of his home bourough, and is based on one of the iconic elements of New York buildings, the roof water-tower. During the day it's illuminated with natural light while at night there's a computer-controlled internal lighting system. 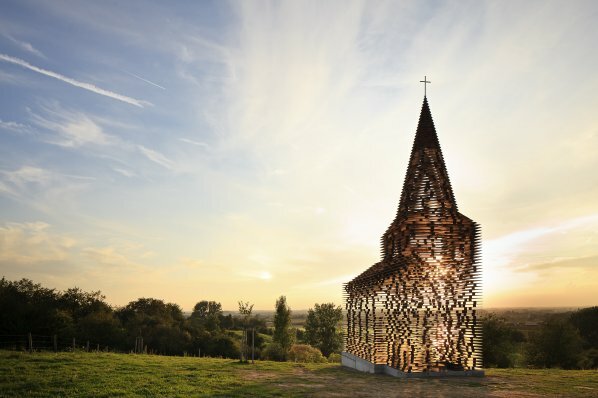 This is also a fantastic example of how photography can make or break an installation. 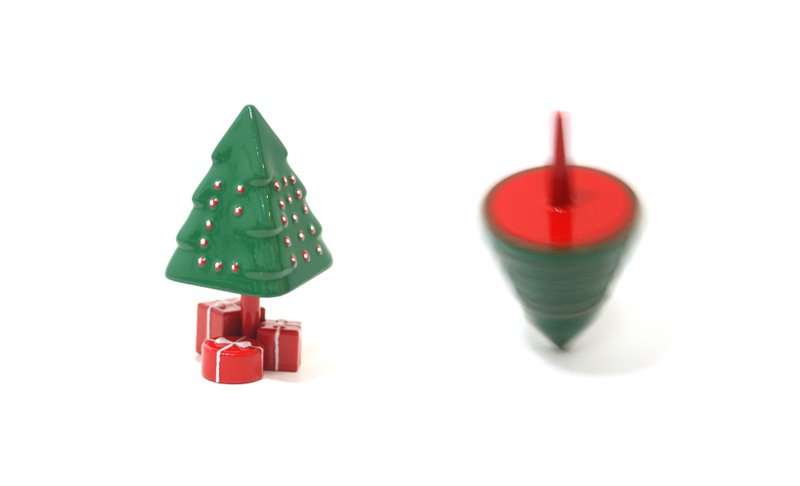 Compare the impact of the first picture with that of the second. 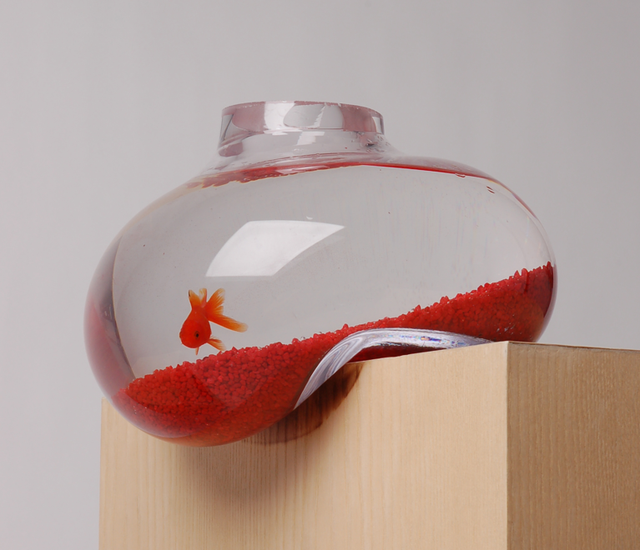 An amusing bit of whimsey from Psalt Design. 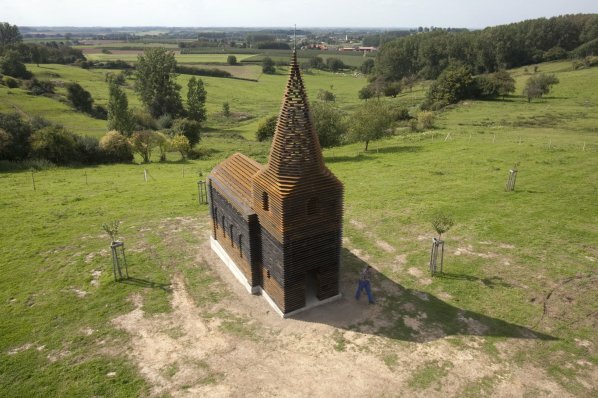 Built of 100 layers of stacked flat steel plates in the Belgian region of Haspengouw,"Reading Between the Lines" takes the form of a church as its starting iconography. 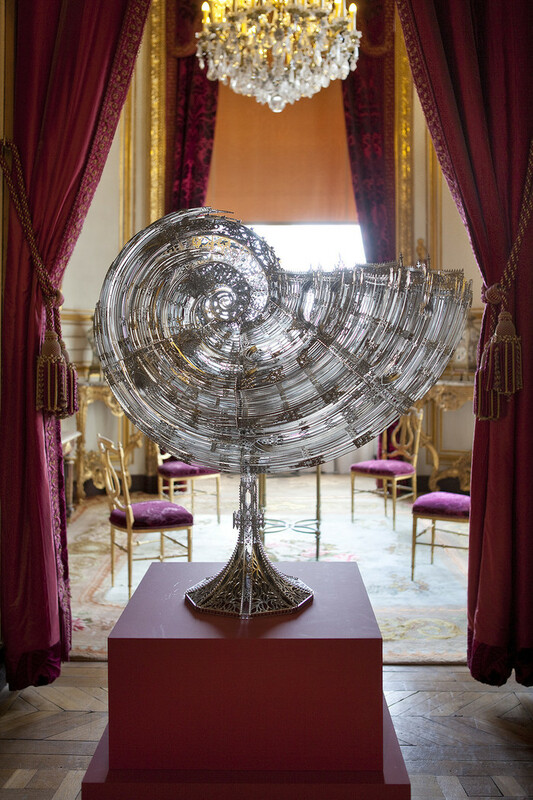 It transforms from solid to nearly transparent depending on the perspective of the viewer. Designed by a pair of young architects in Leuven, Pieterjan Gijs and Arnout Van Vaerenbergh, who collectively go as Gijs Van Vaerenbergh, it is part of a larger exhibition project Z-OUT, an initiative in which Z33, the contemporary art museum of the city of Hasselt, presents art in public spaces. The shades of red and brown are from the rust that has accumulated on the unfinished steel structure. In this closeup from during construction you can see how the layers are stacked. As this is still in the workshop, the fresh grey steel has not yet started to rust. These photos are from the artists website, there are plenty more there and a video clip of the actual construction. 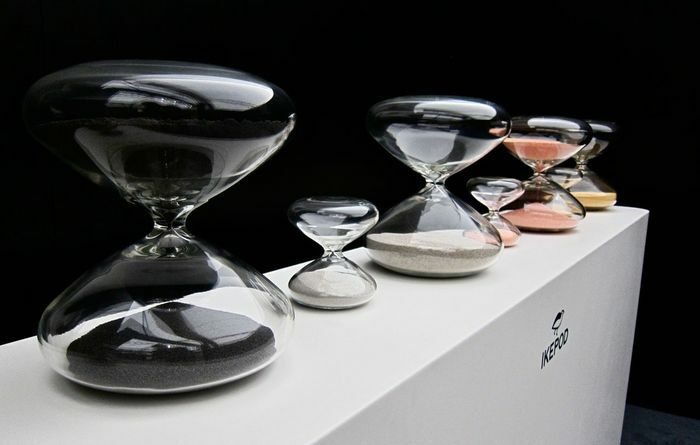 Ikepod is a strange little watch company which has always been focused more on the design side of the watch industry, using reliable but not interesting movements. 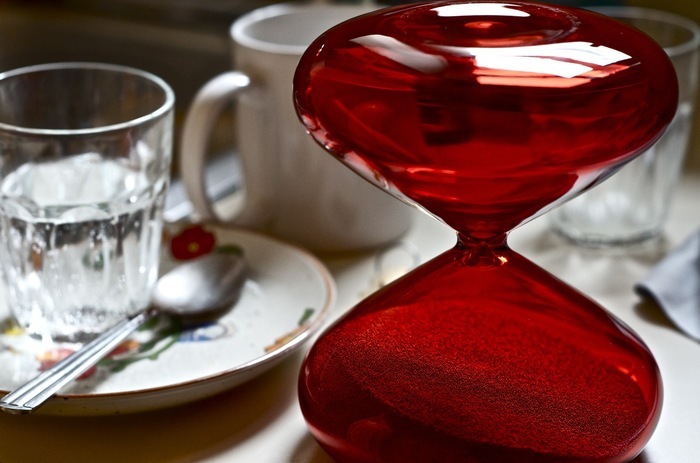 They have worked in partnership with industrial designer Marc Newson (previously mentioned) for a while now, but their release of his hourglass at Baselworld 2011 gave them quite a bit of positive publicity. Those are the basic models, the larger one times abotu one hour and costs about $30k, while the smaller model is about 1/2 the price and times 10 minutes. 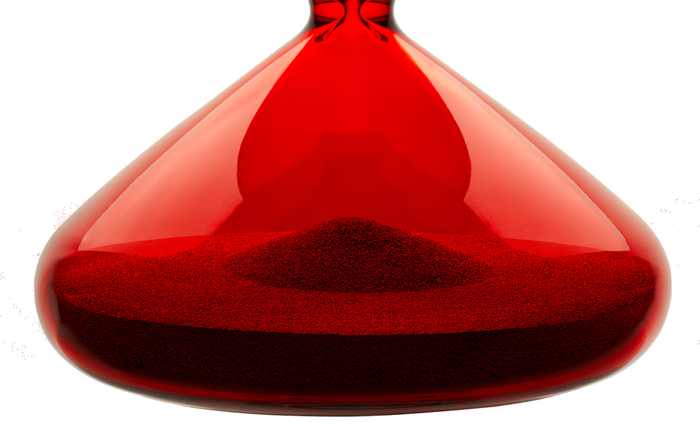 Both are hand-blown from rather thick (3mm) borosilicate glass and use tiny steel balls, plated with nickel, copper, gold or something else for color, for timing. According to promotional materials the large model contains approximately 1.3million balls. 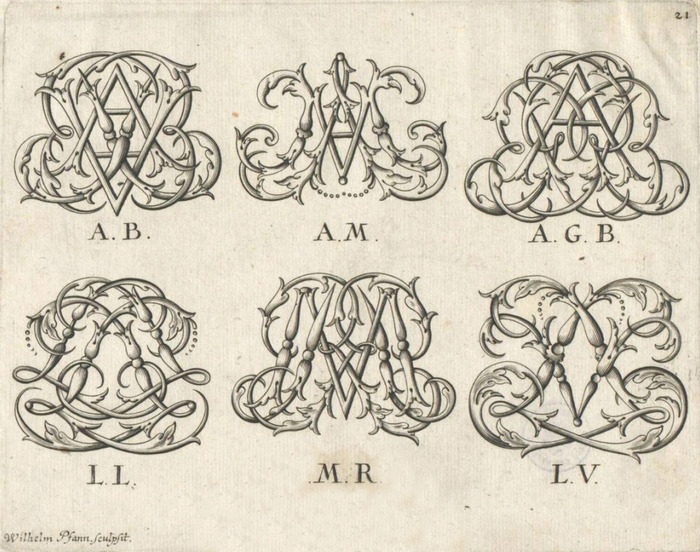 This page is an archive of recent entries in the Design category. Book is the previous category. Diamonds is the next category.